Superior Undead: Clover may be considered Undead at his controller’s discretion. So for effects that benefit him he may be considered Undead, whereas for effects that hinder him he will not be considered Undead. Clover doesn’t suffer from the Uncontrollable rule or have an Influence value. Inhuman Force: If desired, any of Clover’s Attacks can cause Throw. 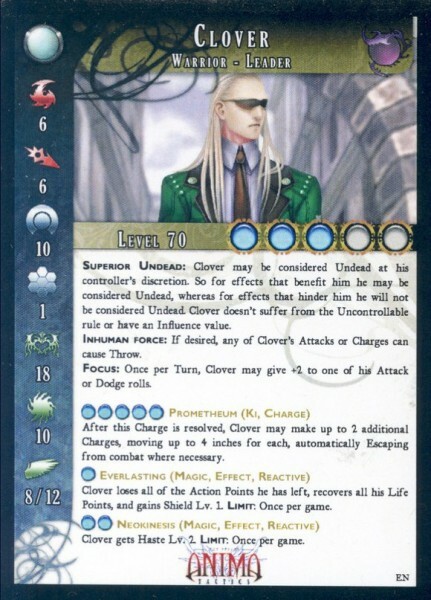 Focus: Once per Turn, Clover may give +2 to one of his Attack or Dodge rolls. After this Charge is resolved, Clover may make up to 2 additional Charges, moving up to 4 inches for each, automatically Escaping from combat where necessary. Clover loses all of the Action Points he has left, recovers all his Life Points, and gains Shield Lv. 1. Limit: Once per game. Clover gets Haste Lv. 2. Limit: Once per game. A part of Team Executive Team along with Bridget Setsuna. Warrior, officer… and more than human, Clover is one of the five original Black Sun seekers who found the Book of the Dead more than a decade ago. Transformed by his contact with the forces of unstoppable power contained within that fell grimoire, he is neither dead nor alive. As the member of the Delacroix family most suited to military command, Clover is now the leader of Black Sun’s security forces, the largest private army on all of Gaia.